It was so cool out yesterday, I started dreaming of lighting the our gas heater. 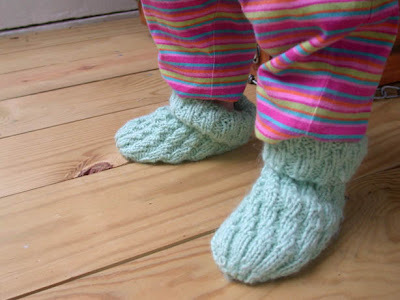 I started some footies for L last winter - and only finished them about a month ago. Luckily, she hasn't grown that much. So here they are. 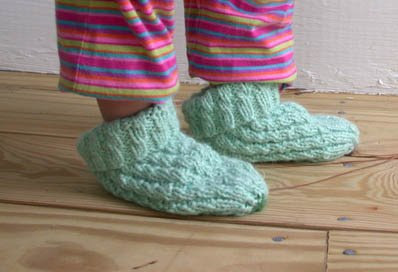 A gorgeous design (I used this pattern), they are made from oh-so-soft alpaca yarn. I had to roll the tops so they wouldn't slide off of her feet. I'm thinking of put a little elastic cord in the ribbing at the top, but I'm not really sure how. After wearing them for only two minutes, they'd already gotten all fuzzy. oh well. When I finally got to the toe of the second foot, I ran out of yarn. Seriously, I was binding off. So you can see in this second picture, the toe is a darker color.